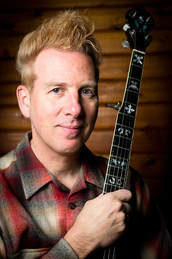 Dave Keenan is a full-time musician and teacher in his home town of Seattle, Washington. Dave has been teaching banjo since high school and performing since the age of 11. He is a member of several bands in Seattle, teaches privately and at the Dusty Strings Music School. He has been a teacher on banjo, guitar and mandolin at the British Columbia Bluegrass Workshop for 15 years, the American Banjo Camp, Puget Sound Guitar Workshop, California Coast Music Camp, Shasta Fiddle Camp, Lake Country Fiddle Pal Camp, Swannanoa Old-time Gathering and Steve Kaufman's Kamp in 2013, ’14 and ’16. Dave is a member of the bluegrass band “The Downtown Mountain Boys” whose new CD “Hey John” was the featured CD in Bluegrass Unlimited’s June 2018 issue.